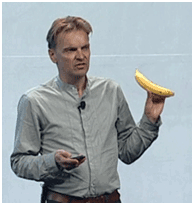 What Do Bananas and Social Computing Have in Common? This past year’s TUCON had some amazing Keynotes; some inspirational, others educational, and of course there where those that were entertaining. But when Chris Robinson, CIO of KPMG Australia, came out on stage holding a large banana, I realized this was going to be all of the above. He related the story of a client who threw something of a curve ball at the firm. The client, who’s in the fruit smoothie business, asked KPMG to help solve a vexing problem: “How to automate the task of peeling lots of bananas quickly and cheaply?” Employing humans to do this would cost too much, while machines tend to smash the fruit, since bananas come in all shapes and sizes. Even for a consultancy that boasts all kinds of experts in retail, manufacturing and technology, KPMG was stumped. Before telling the customer they didn’t have an answer, the team at KPMG decided to pose the question on the company’s enterprise social networking platform. Very quickly, they received an innovative answer from a 22-year staff member who wasn’t on the project. The result: A satisfied client, who ended up giving KPMG more work and a new career direction for the 22 year-old. Without a platform to exchange ideas and engage in conversations, this story wouldn’t have met with this great ending. Indeed, Chris credits social collaboration, both the mindset and enabling tools, for allowing this young staff member and her idea to surface. What is compelling about this story is that people often think of enterprise social tools as a “nice-to-have,” or another thing that people get saddled with, like email and mobile phones. But this anecdote proves otherwise. It demonstrates that social collaboration is mission-critical, and businesses can reap very real and tangible rewards from adopting social media in the workplace. But don’t take my word for it, hear it directly from Chris. In this webinar, he discusses how social networking is bearing fruit for the firm — from enabling its people to deliver greater value to their clients to greater retention, as staff feel more connected and valued when they join the conversations and contribute ideas that make a difference.